This is a guest blog post by Lilach Bullock, a social media and lead generation expert. Instagram is one of the best platforms for nonprofits and charities to reach a socially conscious audience. While Facebook usage is steadily dropping, Instagram is staying strong with 1 billion monthly active users and 500 million daily active users. Plus, if you’re hoping to reach out to younger generations, it’s the platform to use: 59% of Millennials are active users, as are 80% of Generation Z. However, it’s not just a case of posting occasionally. In order to stand out among the plethora of Instagrammers fighting for people’s attention, you need to develop an Instagram strategy for your nonprofit. Being organized and strategic will ultimately help you save time and resources, as well as generate better results. Why Do You Need a Nonprofit Instagram Strategy? Many nonprofits or charities have a limited marketing budget—there are always so many other things that need the money first! But when your budget is limited, you want to make sure that all your time, money, and other resources are well-spent. Establishing a strategy can also help you make sure that Instagram is truly the right platform to accomplish your goals, and that it’s right for your audience. Once you know what you want to achieve through Instagram (or any other social network for that matter), you’ll be able to plan the content that will help you achieve these objectives. What do we want to achieve with Instagram? How can Instagram help us reach our overall objectives? Do our goals for social media center around awareness and engagement, or around donations? Outline each objective that you want to reach and be specific about it. If you want to get more results for your time and effort, you should also establish clear deadlines for specific goals. Once you’ve decided on your goals, you can start measuring its success so that you can understand what you did right or wrong—and with this knowledge, improve your strategy as you go. For example, if you wanted to raise awareness of your nonprofit, you might set an engagement objective, like a 20% increase in comments in 30 days. You can then track which kind of post gets the highest number of comments, and try to recreate it or iterate on it in order to continue the trend. Once you know your objectives, you also need to decide who exactly you’re targeting with this content. You can only start creating content that will resonate with your audience once you know exactly who you’re targeting. This is crucial because if your audience doesn’t find your content relevant, they won’t take action. For example, a lower-income audience might not be as likely to donate to your charity or nonprofit, so to combat this you could create content to tell them that even the smallest contribution counts—or that sharing their time is equally as important. The same goes for interests. Let’s say a large chunk of your audience is very interested in sports. In that case, they’re more likely to react to your content if it includes sports-related imagery. ...and any other information about your target audience that will help you create content that resonates with them. To put together these personas, start by talking to your current supporters. You could send out an informal poll asking them what kind of content they’d like to see from you, or just see which of your current social media posts have performed best. You can also check out their social media feeds, to see what kind of content they’re sharing and reacting to. Once you’ve done these two things, you can start planning out what your Instagram feed will look like. You don’t need to write and create each and every post months in advance, but putting together a content plan or social media calendar for your Instagram strategy helps in several ways. Firstly, when you plan your content in advance, you can make sure it’s the best it can be. You don’t have to scramble at the last minute to post something just because you have to, but rather you have the time to think of a great idea and put it into practice. You can also use your calendar to make sure that you’re creating a good variety of posts, instead of posting the same thing repeatedly and boring your audience. Scheduling can also help your organization be more coordinated. If you have any specific donation or membership campaigns coming up, planning a calendar in advance will also help you ensure you’re properly promoting it, instead of publishing updates whenever you have a spare moment. And finally, preparing your calendar in advance means you can schedule your Instagram updates using apps such as Tailwind or Hootsuite (or just preparing drafts in the app ahead of time) and save time during your busier days. There’s a ton of content being shared on Instagram every minute, so if you want your content to reach your audience, you’ll need to post new updates frequently — preferably several times daily. What times will you post? Research shows that the best posting times for nonprofits are during weekdays in the afternoon. However, the best way to find what works for your nonprofit is to experiment. Post updates at different times to see how they affect your results, especially if you have a global audience. What important dates are coming up? Are you running any campaigns in the next few months, or do you have an important event organized? Make a note of these in your calendar to make sure you create the right content when it’s needed. Every brand — whether a business or a nonprofit — should have clear guidelines of what they should and shouldn’t post on their Instagram account. Start by explaining what your “voice” is. For example, should your posts be funny and cute? Or serious and emotional? Then, outline what is and isn’t allowed, so that any volunteer who posts on your Instagram is very clear on what type of content you want. You should also be clear on how people should respond to comments, both positive and negative: who is allowed to respond? How should you handle criticism? However, don’t overdo it: if you’re constantly promoting yourself, you might put off your audience. Instead, make sure you have a good mix of this type of content and the others listed below. Social media users are big fans of motivational quotes from famous or interesting people. In some cases, you can also use them to help promote your campaigns. These posts are easy to create and, no matter what your nonprofit or charity focuses on, there’s a simple way to incorporate them in your content strategy. Search for quotes that are relevant to your non-profits’ mission and that you can tie into your campaign. For example, if you had an event coming up and wanted to get more volunteers participating, you could use a powerful quote like John Holmes’ “There is no exercise better for the heart than reaching down and helping people up” and use the image caption to urge followers to get involved in your mission. Try experimenting with different types of content, depending on which holidays are relevant to you, while staying true to your nonprofit’s branding and identity. But posting isn’t the final step. 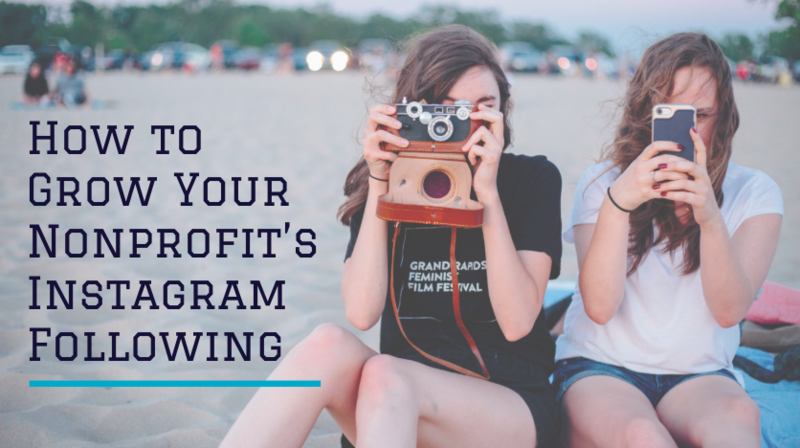 In order to keep growing your nonprofit’s Instagram presence, try to measure your results regularly to find out which posts work and which don’t—and, of course, to see if you’ve reached your objectives. Tracking your metrics will help you learn what types of updates work best, when best to post for maximum engagement, and which hashtags generate the most reach. This way, you’ll be able to improve your Instagram strategy time and time again, and make sure your resources are well-spent. If you’d like to learn more about growing your Instagram following and getting more members, join me on November 14th at the Free Membership Growth Online Summit. My webinar is part of the Wild Apricot Free Membership Growth Online Summit 2018 during the week of November 12, so you’ll also get free registration for four other expert webinars. Highly regarded on the world speaker circuit, Lilach has graced Forbes and Number 10 Downing Street. She is listed in Forbes as one of the top 20 women social media power influencers, named one of 10 top digital marketers by Brand24 and was crowned Social Influencer of Europe by Oracle. She is listed as the number 1 Influencer in the UK by Career Experts and is a recipient for a Global Women Champions Award for her outstanding contribution and leadership in business.